Advent is my favorite liturgical season. In some ways the picture chosen for our bulletin this Sunday gives some explanation of this. For me this picture represents the darkness that we all know in life, the mystery and beauty of life, the hope that comes with each dawn, and the power and majesty of the Creator. It is advent that reminds me of all that God has done, is doing, and promises to do in the future. And of course, hovering all around us during advent are reminders of the first Christmas, that God loved us so much he/she became one of us– the infant Jesus. What a magnificent day it will be when Jesus comes again in Glory! 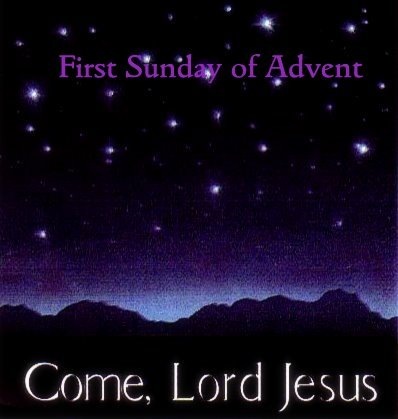 Come Lord Jesus, come Lord Jesus, the Christian Church prays in hope during this remarkable season. I am. I was. I will be. I am not coming soon I am here. Who turned my mother away. On that night were you listening? On that night the “least of your brothers” was me. Now do you see, do you hear and do you care? Looking for my reflection in your heart? Their muttered plea or in their tear? To ask forgiveness and trust? Do I not forgive you always? Do I not give you a merciful ear? Fulfilling the promise of God’s care. Welcome to Advent and the New Church Year – May God inspire us all in God’s ways. Happy New Year!